First, split the sugar, mint, & lime juice between two cups & muddle the mixture. Next, fill each cup with ice & pour 1/2 can of DASANI® Sparkling Lime in each cup. 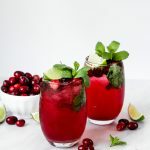 Top each cup with 1/2 cup of Simply® Cranberry Cocktail & garnish with fresh cranberries, a slice of lime, & a few mint leaves.